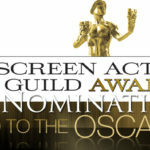 The betting agencies are probably working overtime right now, as the nominations for the Screen Actors Guild Awards for 2013 have been announced. Check out who is up for what, after the jump! 12 Years A Slave has, as expected, garnered some hefty acting nominations, with both Chiwetel Ejiofor and Michael Fassbender up for the two main male acting gongs, with Lupita Nyong’o in for a pound in the female supporting category, while Sandra Bullock’s dazzling performance in Gravity has been rewarded here. Tom Hanks looks a shoe-in for another Oscar nom after scooping a SAG nomination for Captain Phillips. I am surprised that SAG didn’t find room for Robert Redford, after his stand-out role in All Is Lost. Watch out for Jennifer Lawrence to go close to Oscar next year with her performance in David O’Russell’s American Hustle, which is getting a lot of traction within the industry. Judi Dench looks great in Philomena, too, so keep a close eye on that one. I’m not entirely sure who stands up on the stage to received the “…by a cast in a motion picture” award, which seems to me like a giant catch-all for the poor chumps who weren’t up for the main gongs….. Is this SAG’s version of a Participation Award?